Here are some of the sweets we have in small pouches which are transparent plastic containers of 70 x 44 x 20mm with a logo print area of 48 x 11mm or a flat label size of 62.5 x 47.8mm. 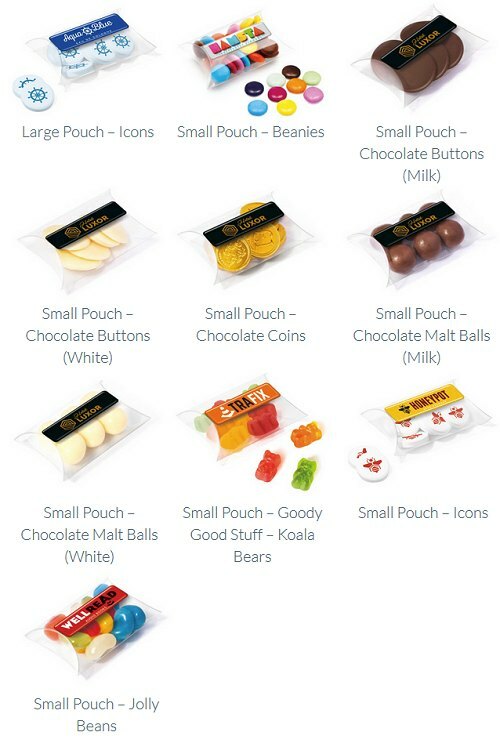 Small pouches are available for: Beanies · Chocolate Buttons (Milk) · Chocolate Buttons (White) · Chocolate Coins · Chocolate Malt Balls (Milk) · Chocolate Malt Balls (White) · Goody Good Stuff - Koala Bears · Icons · Jesters · Jolly Beans · Millions · Skittles · The Jelly Bean Factory Jelly Beans. We have more products than shown above. Please ask Crazy Dave about these small pouch container options.